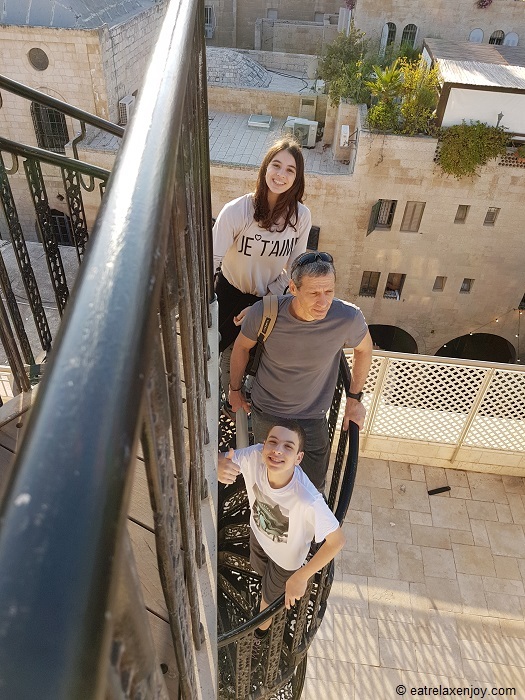 A family Trip in Jerusalem is a good idea anytime. 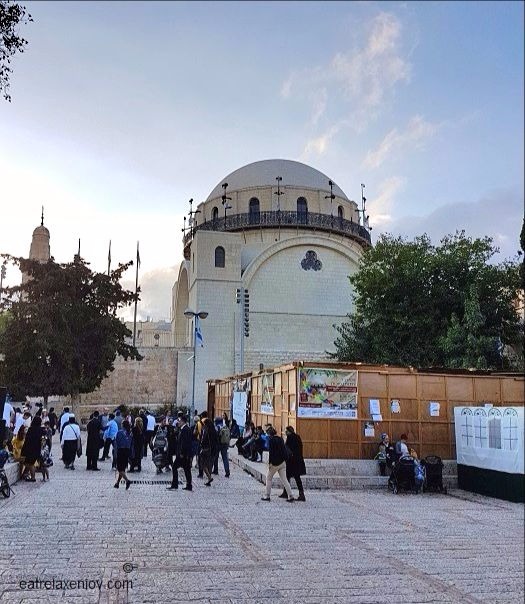 Sukkot, with the special activities and great weather is a good time to come to Jerusalem and enjoy the sites that the city has to offer. You can spend a full day and not finish everything, below and above ground and high on the walls, and also in the evenings. 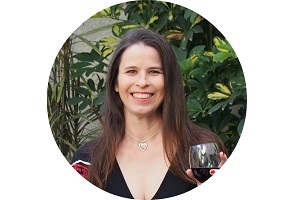 That’s exactly what we did this Sukkot! We started our trip in the afternoon, after the rain stopped. This is what it is like during this time of the year, the rain takes you by surprise. We were a couple with two teens, a challenge, as they are impatient and prefer the fresh air over long explanations about history. 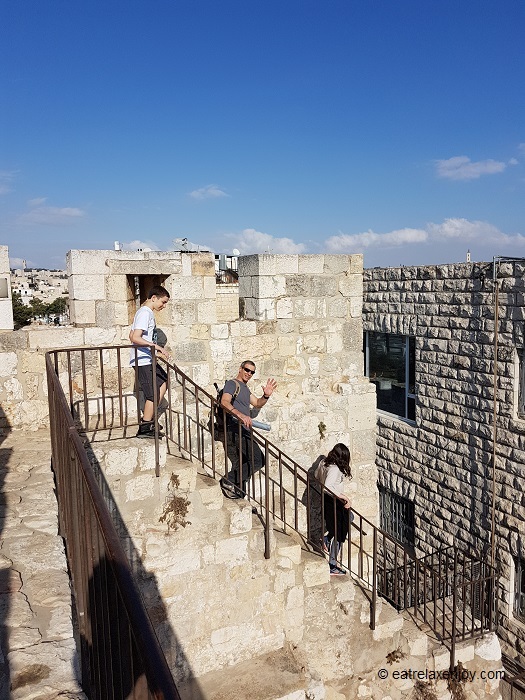 We went up to the walls near Jaffa Gate. The Southern part of the walls is nicer but the Northern part also provides an opportunity to experience the ancient walls and see the city from above (although sometimes it is just backyards). We aimed to walk all the way to Tzidkiyahu’s cave in the fresh air instead in the crowd. It is only a small section, the promenade continues all the way to the Lion’s gate. 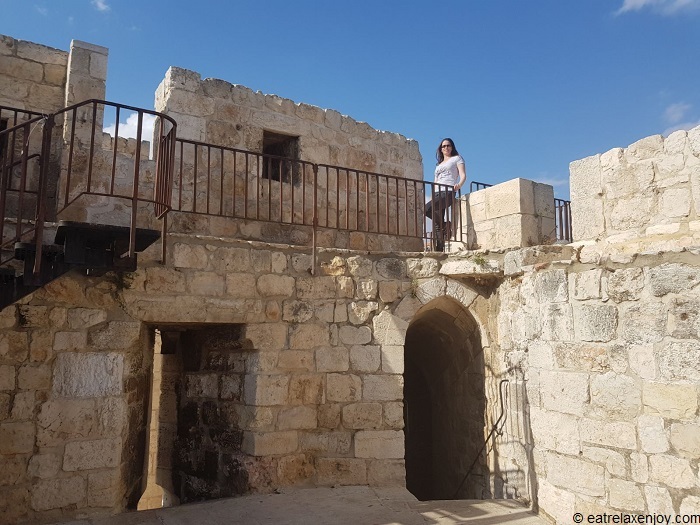 The entrance to the Northern Wall top promenade is adjacent to the gate (on the other side of the David Citadel) near the information center, where you can buy a ticket, entrance is via an automatic revolving gate. The promenade is not accessible, there are many stairs and walking is on rough terrain. It took us 15 minutes of relaxed walk to get to Damascus gate. The view isn’t always the best but walking on the walls is fun and the teens enjoyed it. 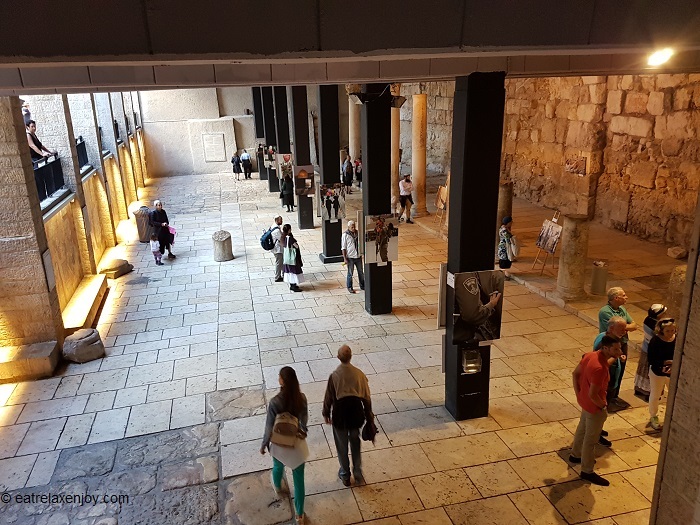 When we got off the walls we went out of the old city via the Damascus gate and headed to the entrance to nearby Tzidkiyahu’s cave. 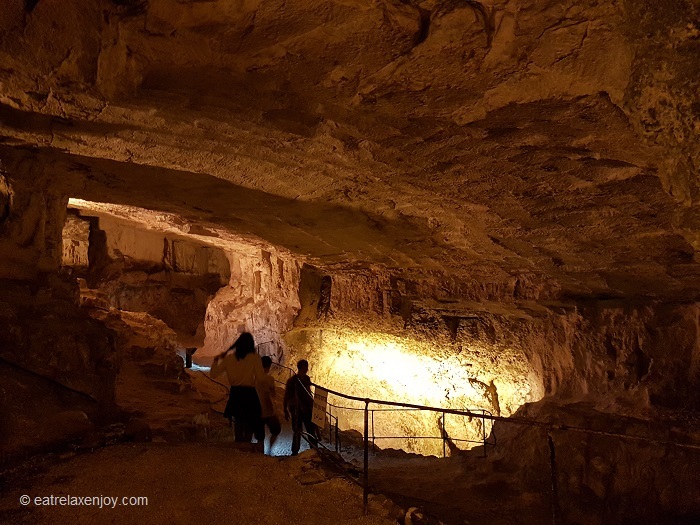 Tzidkiyahu’s Cave is a huge man-made cave that was discovered in 1854. It was mentioned in the bible during Tzidkiyahu’s time and his escape from Jerusalem to Jerico. 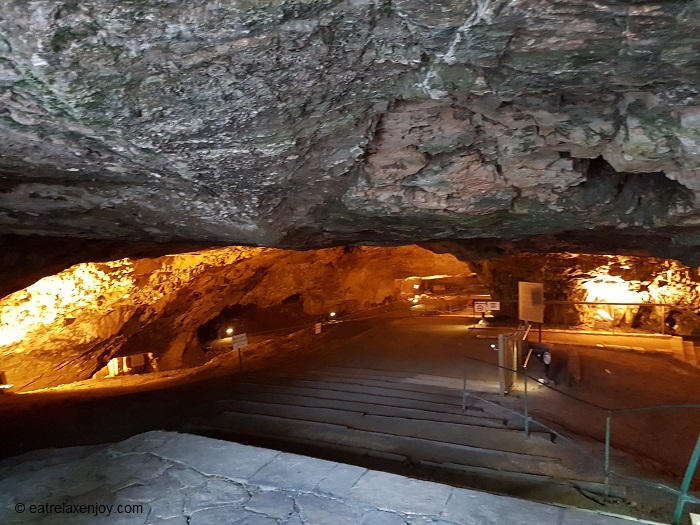 The cave spans over 9000 square meters (more than 2 acres) and is 250 meters (820 feet) long. The cave is lighted with soft lights. The cave isn’t accessible, there are slopes and stairs. It is nicest to get here for concerts but it is also nice as is. We went back to the old city via Damascus gate and crossed the market. Prices here are really cheap and you can also bargain. We went all the way to the Cardo. The Cardo is an old reconstructed part of the old street from the Roman times. 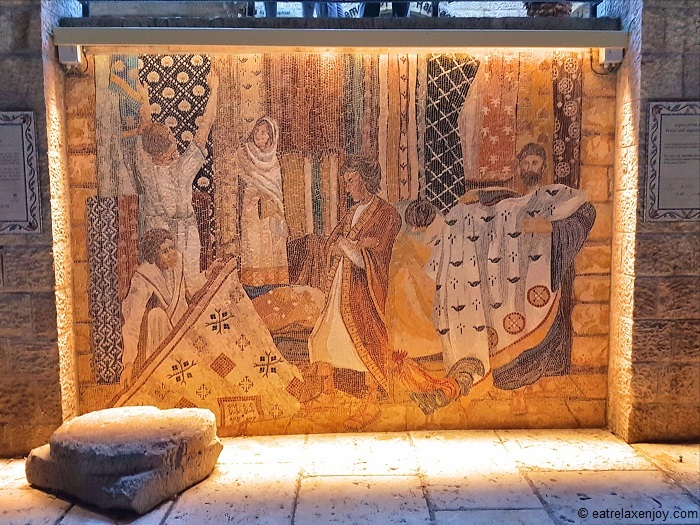 Today it hosts exhibitions and there are new mosaics of the old market on the Eastern wall – very nice! The Hurva Synagogue is located right off the Cardo. 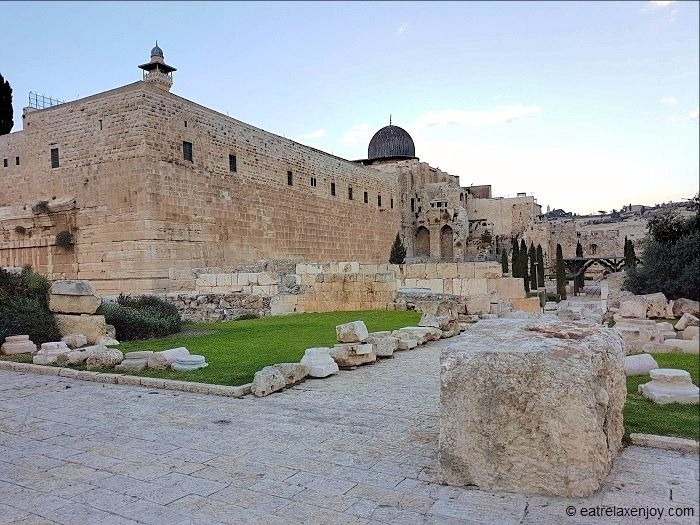 I think it is one of the must visit sites in the old city. 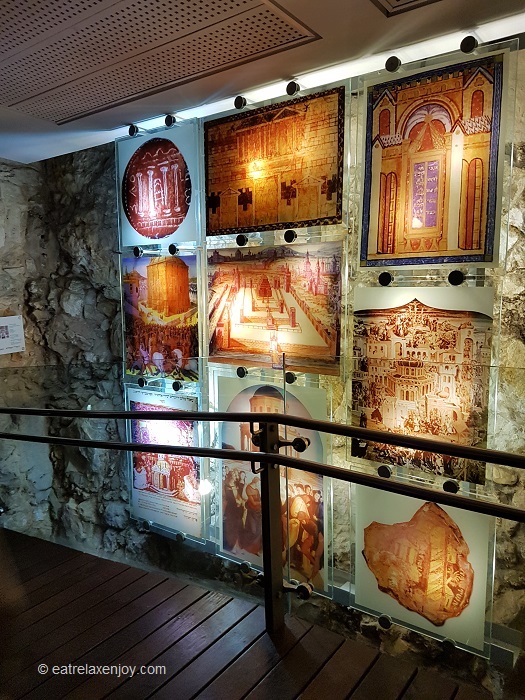 The synagogue that was the first Ashkenazi synagogue in Jerusalem was named Hurva (the ruins) because it was bombed and stayed in ruins for decades. It was recently reconstructed as an exact replica of the old synagogue. 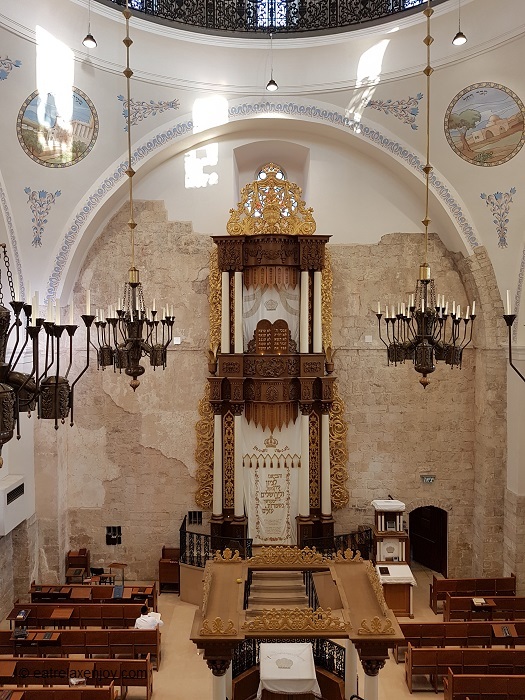 The best view of the synagogue is from Ezrat Nashim (the women’s section). Where you can also climb up to the roof and enjoy the beautiful view of the surrounding from the balcony. Although access is via steep winding staircase and it might be problematic for some people. You can read more about it in the post The Hurva Synagogue. Ten feet below the street level under the old city is where the remains of the Jewish quarter were found. The quarter is where the Cohen’s (the Jewish priests) used to live. The quarter is the remains of a very luxurious house, which raises questions about their way of living in times when the Jewish people was very poor and providing for them. You can read more about it in the post about The Herodian Quarter. From here, you can continue to the Burnt House, which was closed when we arrived, or to the Western Wall. We continued to the Archeological Garden. The Archeological Garden is right off the Western Wall, but it is much lower in elevation, and in fact where the old street was during the old days. 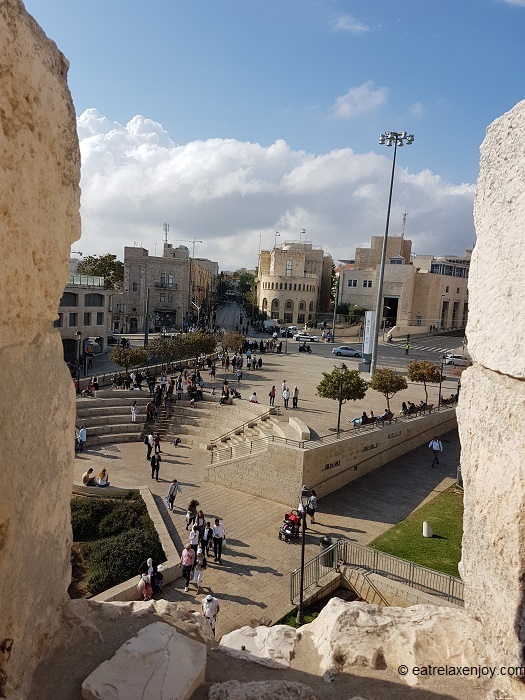 Part of it is the old market street that used to stretch over one kilometer from here north, all the way under where the old city is now (and under the Western Wall plaza). 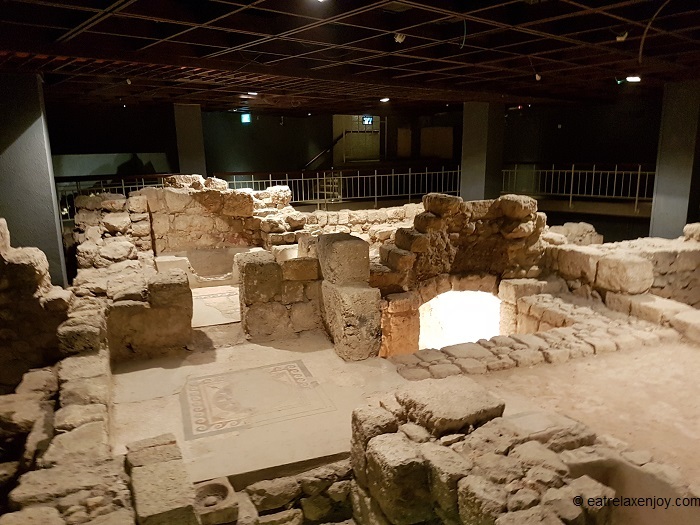 The Davidson Center museum is an impressive building built on the archeological remains that were reconstructed and its architecture is beautiful. It is the house of many archeological artifacts such as jewelry and the original bullet of the king. 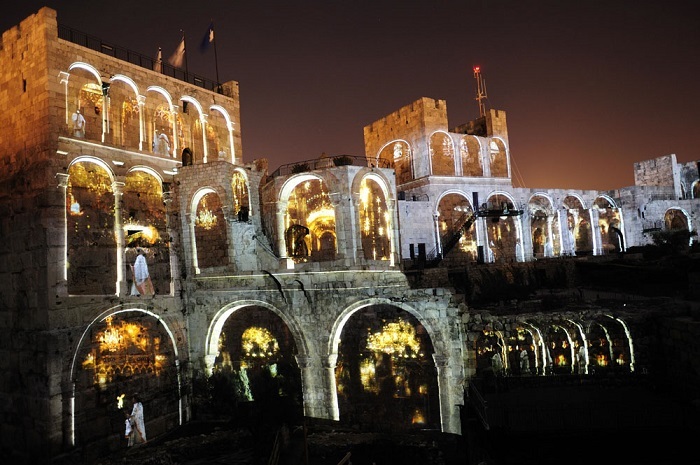 In a tour of audio and video it presents the history of old Jerusalem. 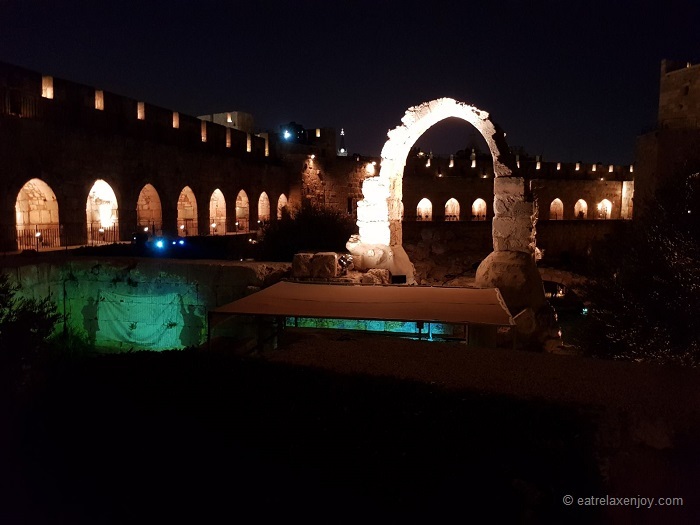 There is something enchanting in lights and sounds in archeological sites (this also makes visiting the archeological garden at nights very special). The visual show at David Tower is a 45 minutes experience starting with a walk to the little amphitheatre in the tower’s garden. Visitors are walking among scenes presented with lights on the walls. 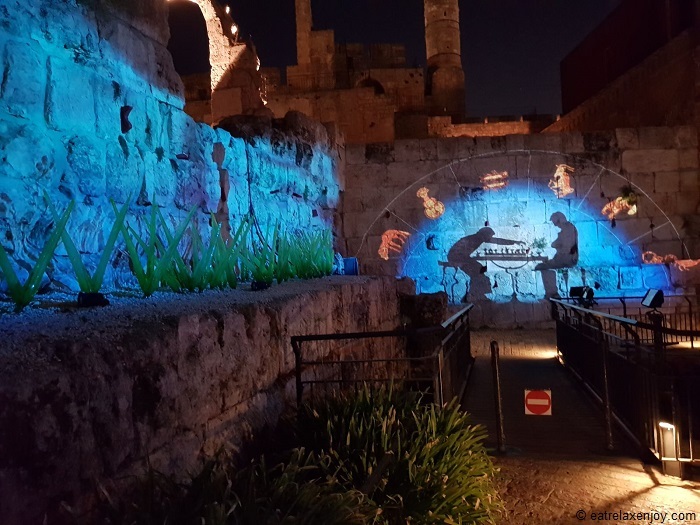 The show itself is a high-quality projection of scenes from the history of Jerusalem, presented on the walls of the citadel, 180 degrees (or even more) of projection! The story itself is not unusual; it is the impressive projection on the surrounding walls that is fascinating! Bring a sweater, it gets chilly here in the evenings. 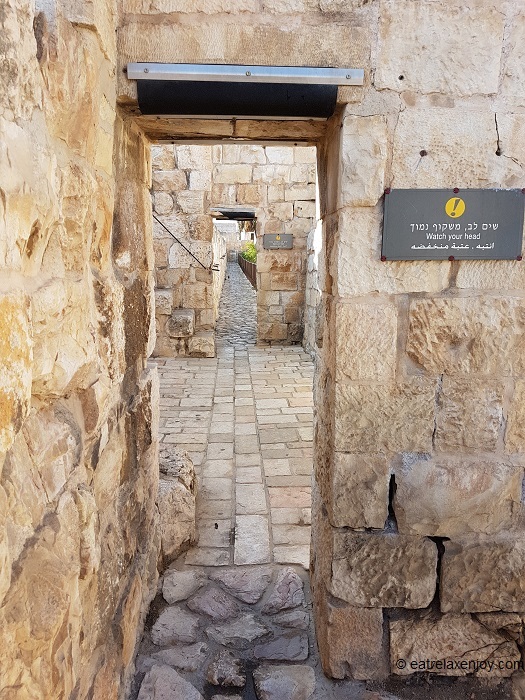 During the holidays, such as in Sukkot, there are many tours of the Jewish quarter and great entrance deals such as family entrance. 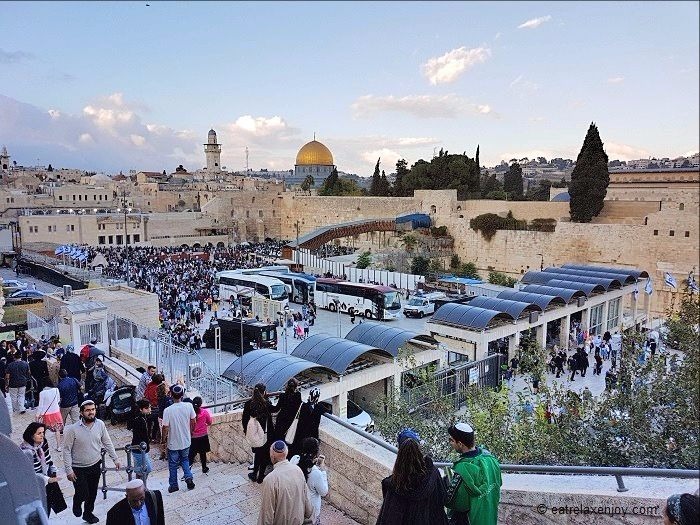 There are also Segway tours and a new virtual escape room for the whole family, also rappelling from the walls of Jerusalem.